Located on the west end of one of City Place's most happening streets, Clematis Street; 610 Clematis condos is located in the very heart of Downtown West Palm Beach, in City Place. 610 Clematis brings luxury living to the hip and trendy Clematis Street. 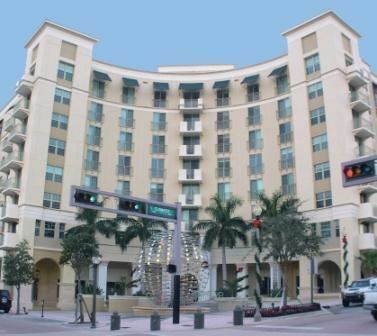 The popular high-rise building of 610 Clematis is home to 246 condominiums with a variety of spacious 1 bedroom, 2 bedroom, and 3 bedroom homes. Homes for sale and rent in 610 Clematis feature top of the line gourmet kitchens, stainless steel appliances, tile and wood floors, high ceilings, impact resistant glass in all windows and sliding doors, granite countertops and more. Residents enjoy the buildings extensive list of amenities including; a luxurious and relaxing Zen garden, infinity edge lap pool with Jacuzzi, fitness center with sauna and steam room, Yoga and Pilates room and 24 hour manned front desk. 610 Clematis is a pet friendly building ideally located in walking distance from the exciting City Place, Palm Beach waterfront, local restaurants and top notch dinning. Perfect for full-time and seasonal residents, 610 Clematis is close to Interstate 95, Palm Beach Gardens, Palm Beach International Airport and more. Few residences offer city style living with the retreat of an all-encompassing peaceful lifestyle. 610 Clematis does. The Zen Garden and Courtyard are amazing, providing a spiritual environment where colorful bougainvillea are a sight to behold. Tropical bamboo and umbrella plants enhance the scenery, as do Oriental Pergolas with flowering vines. Water lilies grace the serene reflecting pool. In the distance, across a pristine footbridge, the red tile roof of an authentic Tea House beckons the visitor down the serene path.